"I was thinking about you all the other day and how now more than ever the work that you do is so important in showing young foreign leaders what America is truly all about." 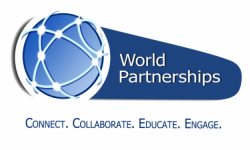 "I gained so much from my experience at World Partnerships which I hope to carry with me always. Every visitor, every home hospitality, every handshake brought me closer to the world as we each know it can be, a world of partnerships, civility, and determination to leave this wonderful place better off than we found it. Each and everyone of you are held close in my heart and I keenly watch everyday as you change the world. Connect, Collaborate, Educate, and Engage!" University of Nebraska at Omaha, Economics & Anthropology, 2014; former intern, International Republican Institute; campaign staffer for first woman mayor of Omaha; currently community relations assistant to Omaha Mayor Jean Stothert, and US Marine Corps Reserve.